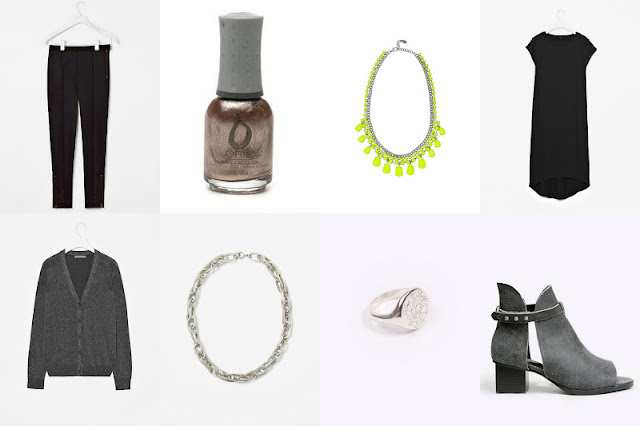 A few Pieces I'm lusting after at the moment. It hasn't slipped my attention that these are decidedly winter inclined. I am really not a fan of summer clothes so I am subconsciously reflecting that here! One thing I don't own yet is a pair of trousers. Not one pair. The more I think about it the more a pair of slim fitting tailored trousers appeal to me and these Cos ones seem to fit the bill perfectly. My love affair with Cos continues with the black midi dress, silver chain and sparkly cardigan. The are very much on my radar and when I get paid I think I will have to make them mine. After seeing a few pictures about of people with rose gold nail polishes I began a hunt for the perfect shade. After looking at swatch after swatch I think 'Rage' by Orly could be the answer to all my polish prayers. Its a real shame that the neon necklace form Zara is sold out literally everywhere as I would love to get my hands on it. Same with these Cheap Monday boot/sandal hybrids, I can't find them in a size 7 online at all and I have yet to see them in a real shop. To me they are the prefect pair of shoes but I'm coming to the realisation that I don't think I will ever own them! Last but by no means least is the Vivienne Westwood signet ring, its available but quite out of my price range, some saving is in order for this one. But this is after all a wish list and not a shopping list. oh thanks babe! I need to get saving!